Welcome back to the Ray Pest Control blog! Summer is coming to a close, but that doesn’t mean the threat of bed bugs invading your home is ending. In fact, it is a common belief that bed bugs are only active during the summer, and while they may be more active during the warmer months, bed bugs are a year-round problem. 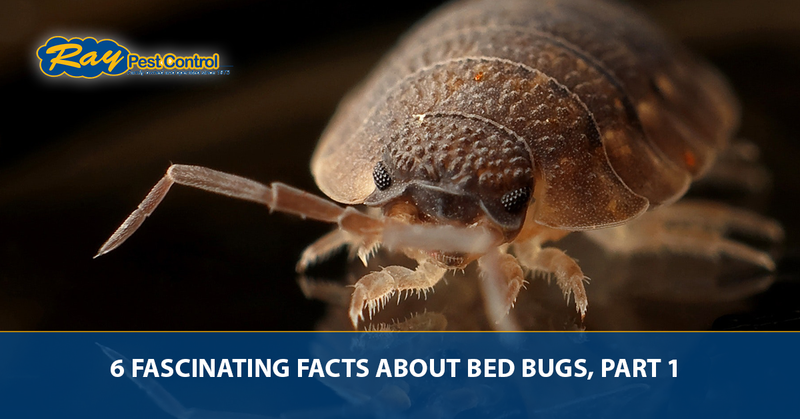 Today, we will look at some more interesting facts about bed bugs to help residents and business owners in and around Piedmont gain a better understanding of these sneaky pests. If you think you have bed bugs, call Ray Pest Control right away to schedule a bed bug inspection. If we identify bed bugs in your home or business, we offer safe and effective bed bug removal in Piedmont to get rid of those pests for good. Did you know bed bugs love to travel? It’s true! This is one reason why they have become one of the most common pests in North Carolina and beyond. In fact, bed bugs are spreading throughout the U.S. at an annual rate of 500 percent. In fact, With the growing rate of domestic and international travel, a bed bug can climb into a person’s suitcase pocket and be introduced to a whole new home where they can take up residence. They love to hitch rides in luggage, backpacks, furniture, and used home goods. They aren’t called the “hitchhiking bug” for nothing! The CDC reports that female bed bugs lay about five eggs a day over the course of their life. Generally, adult females can lay anywhere between 10 and 50 eggs that will hatch within one to two weeks. What’s more, if the conditions are right and a female bed bug has access to a consistent blood supply, she can lay as many as 500 eggs in her lifetime. While one of the most common places bed bugs invade is residential homes, these pests will gladly move into any structure. Hotels, motels, hostels, resorts, and other travel lodgings are some of their choice locations to live. Apartments, condos, townhomes, military barracks, and public housing are also at the top of the list. Bed bugs also love schools, dorms, office buildings, movie theaters, clinics, hospitals, and clinics. Are noticing the pattern here? They prefer places where there is an unending buffet of human blood, often where there are higher populations of people. One saving grace is that bed bugs do not have wings and therefore can’t fly. While they do have front wing-like features, or “wing-buds,” they have no wings that can actually get them airborne. Additionally, bed bugs are not the best jumpers, which may also provide some relief for your worries. Bed bugs go through several stages of life before reaching full adulthood. They begin as an egg and go through four nymph stages before reaching their fully matured stage. In general, bed bugs have a lifespan of about 6-12 months, but have been known to live longer in ideal conditions. Unlike their bloodsucking counterparts — the mosquito and the tick — bed bugs are not known for spreading diseases. Bed bugs do bite and feed on blood, which can leave behind red, itchy, unsightly welts that, with excessive itching, can become infected; however, they don’t carry and transmit any known diseases that threaten humans. These are just some of the interesting facts about bed bugs, so join us for part two learn even more about these fascinating critters. If, in the unfortunate case, your home, business, building, or property becomes infested with bed bugs, don’t delay in taking care of the problem. Ignoring a bed bug infestation will only lead to a more severe infestation. As a Top Rated Local® bed bug exterminator that has proudly served communities in North Carolina since 1973, the Ray Pest Control team is determined to eliminate your bed bug problem for good. Call or click to request a free, no-risk bed bug inspection for a bed bug removal in Piedmont and let us turn your bed bugs into dead bugs.